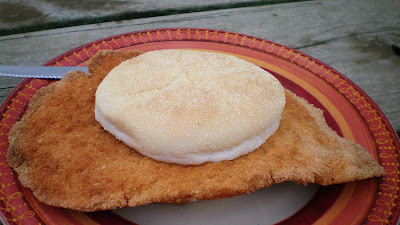 I had heard there was a small town pub and grub in not so far away Peru, and that it served a homemade tenderloin. A recent trip to Madison County meant I could make it down the county roads to this small burgh. A special note about unincorporated community of Peru, it is not to be confused with the township of Peru in Dubuque County. Neither is it to be confused with the South American country of Peru. But together with the incorporated town of 153 people next door known as East Peru, the area around here is sometimes referred to simply as Peru. During my visit I did not have time to verify correct pronunciation, but I assume it is to be pronounced like "pee roo". Wikipedia tells me Old Peru had an operating Post Office from 1853 to 1903. The google maps profile had ads for "Peru Holidays Packages" and "Thousands of Brides from Peru", I assume they are referring to the South American country with the same name. Location: google says the address is 113 Brown St. on the main street with two or three occupied buildings in Old Peru, about 45 minutes from Des Moines in Madison County. Directions: East Peru is on County Road G68, sometimes listed as Peru Road. You can reach Peru Road by taking I-35 to the Truro exit, or taking State Highway 169 south from Winterset. The tenderloin: The from the bar area you can see the lady working the bar and waiting tables hand breads these things to order in a small kitchen. 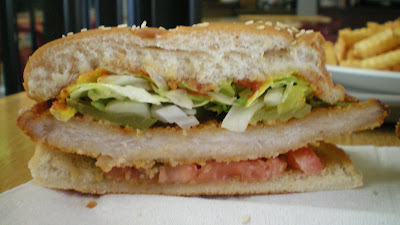 The hand breading and tenderizing means the thickness varies significantly, with folds and crunchy parts found in each bite. 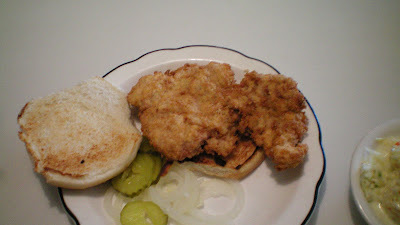 Each tenderloin seem to form a giant cup-like shape that holds the fixins under the toasted bun. Overall 8.0 out of ten. 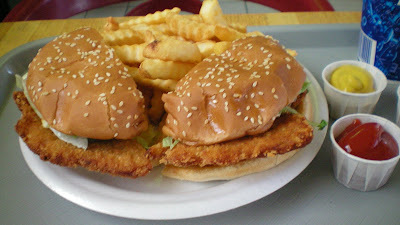 Also on the menu: you can get an unbreaded tenderloin, or usual bar foods like burgers, pizza or fried stuff. Ambiance: This is a dive bar with the regular beer posters on the wall, there is a big banner that reads "Welcome Hunters". Some fly traps were hanging from the ceiling, but those types of things add "flavor" to a place like this. Seating is available at the bar or at tables, or there is a picnic table across the street. Service: When I visited it looked like one hard-working lady waits tables, tends the bar, runs the kitchen, and operates an antique cash register. She seemed to know the local regulars well. Final thoughts: This may be the closest authentic small town pub and grub with a homemade tenderloin to Des Moines. The travel on the winding county roads in rural Madison County makes the trip feel longer than it truly is. The fact that this area is not on the trail of the covered bridges probably means that few visitors make it out here. So I pulled off the highway in Bayard and the main street was mostly barren save for one place with several trucks parked outside. Seriously, every car parked on Main Street was right in front of Shack's Lounge. That is always a good sign. This was a place nicknamed The Loin Shack, it has a website claiming "with loins like ours they are always good", and a locally famous pork tenderloin on the menu. Location: 306 Main St in Bayard, Iowa (population 536) in Guthrie County, about an hour and a half northwest of Des Moines. Directions: Its just three blocks up main street from Highway 141. 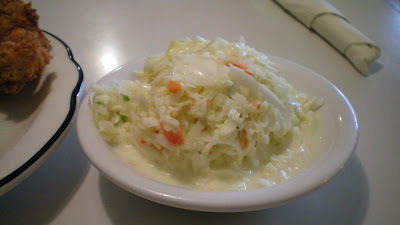 Price: $4.25 a la carte, or a dollar more in a lunch special with choice of side. Also on the Menu: The usual bar foods with fried chicken and burgers. 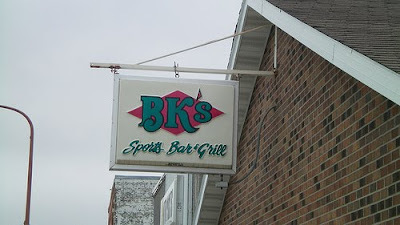 Service: Its seat yourself at booths or at a bar, there were a few waitresses working several tables each. I came in at a busy time, so it took a while to order and then for the tenderloin to cook. I think the owner was working the bar and waiting tables. Ambiance: This is a typical small town Iowa pub and grub with beer posters all over the wood-paneled walls, it was exceptionally busy with locals at the noon hour. The dim lights meant my photos were didn't do the sandwich justice. There is a banner with the words Loin Shack in big letters. 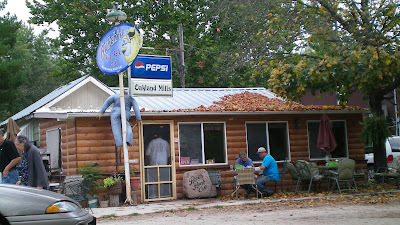 Final thoughts: I can safely say that this is the best place to eat while in Bayard. Van Meter is a small town of 866 people just outside West Des Moines, its most famous for being home to former major league pitcher Bob Feller and there is a billboard on the freeway advertising his "museum". You can see the town by looking past the gravel pit south of the freeway. 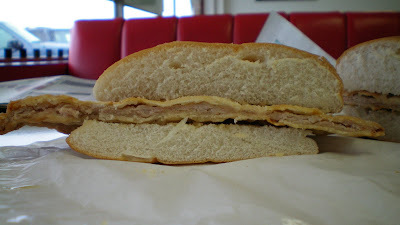 An honorable mention in the top five tenderloins in Iowa in 2007 meant that I had to make the trek almost 10 minutes from West Des Moines to check out this sandwich. Location: 405 Grant St. in Van Meter, just 8 miles beyond West Des Moines, in Dallas County. Directions: You take the freeway past the Jordan Creek exit, and turn south to drive past the gravel pit. This pub and grub is next to an auto shop on the old main street in behind the Casey's in Van Meter. Also on the menu: A typical pub and grub menu with fried stuff, burgers, and frozen pizza. The specialty is the Fat Randi burger with fresh ground beef. Service: Table and bar service. The lady that owns and manages the place, Randi, isn't really fat. 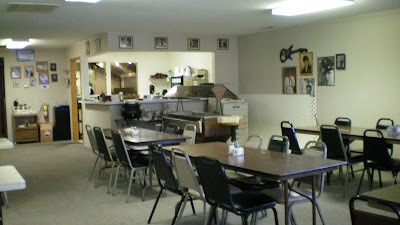 Ambiance: Its a small town bar with tables to eat at and Tv's. The walls are covered with cheap beer puns like "liquor in front, poker in the rear" on painted signs. Every year the cities of West Des Moines and Waukee seem to creep farther west, and since the new mall was built this town seems closer to Des Moines than it used to be. Van Meter may be turning into a bedroom community for people who work in West Des Moines, but Fat Randi's is an authentic small town pub and grub with a good tenderloin. 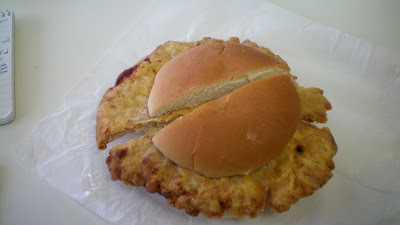 When one travels into the northern regions of Iowa, or further into Minnesota, the pork tenderloins are more likely to be battered instead of breaded. The attraction of Clear Lake means many people visit this area in the summer, and there are plentiful dining options near, or on, the lake. Ventura probably sees its population swell during the summer as people visit the lake. When driving into Ventura, the sign for this place near the entrance to town reads Colony Inn Restaurant and Lounge. Location: 104 N Weimar St in Ventura (population 670), in Cerro Gordo County, about two hours drive north of Des Moines in northern Iowa. Directions: You take the Clear Lake Highway 18 exit West from I-80. Turn south at the sign for Ventura and find the old main street behind the grain elevators. The Tenderloin: First things first, this one was huge, and it looked really good with the fixins on the side of the giant plate. It felt like at least twelve ounces before battering and frying. The big letdown was the lack of any seasoning in the batter. The meat was beaten a little too much, leading to a limp flopping sandwich. It has tons of natural pork taste in the bright white meat locked in by the battering and frying process, but not any other flavor on top of it. Overall 7.5 out of ten. Also on the menu: A big menu with steaks, salads and burgers. Service: Its table service, I visited when it wasn't busy. Ambiance: This place has a hunting lodge style dining area with wood paneling and pictures of game animals. There are booths and a bar to eat at. There is a lounge area in the next room, somewhere is a banquet hall in this large building. The menu here tells me this tenderloin once nearly won a best tenderloin in the state award. But their new website doesn't have it listed on the menu. Maybe its because the sandwich page hasn't been uploaded yet, but I don't know. The people who operate this restaurant also run the kitchen at the seasonally-opened PM Park on the opposite side of Clear Lake. Next on my list in Ventura is the Muskie Lounge with lakeside boat service. 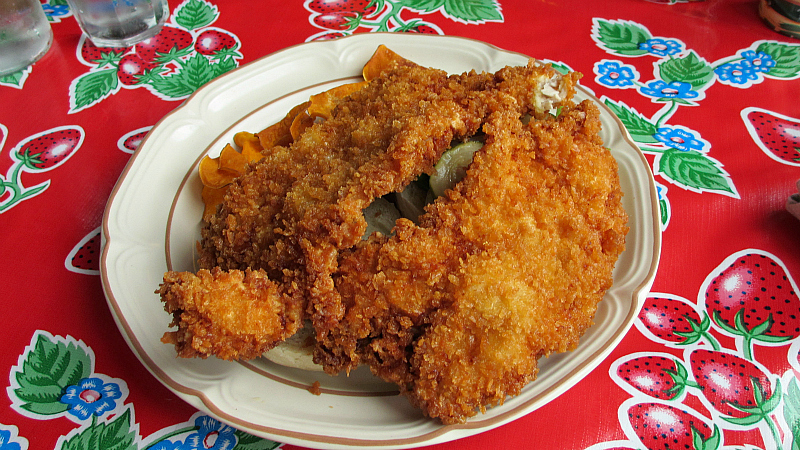 The Suzie-Q Cafe in nearby Mason City serves a battered loin with a lot more flavor mixed in. 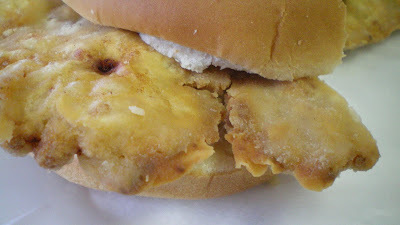 Further west in Algona I found a good breaded tenderloin. Either way, this area has plenty of good tenderloins. The location at the end of the Raccoon River Valley Bike Trail and the nearby Lake Panorama mean Panora gets more visitors than the average small town in Iowa. This means more diverse dining options, a near fully-occupied downtown, but most importantly more good tenderloins. So a couple years ago I picked up a Smoke-Free Dining Guide to Western Iowa, and this place was listed as specializing in homemade tenderloins. I had to check it out. Location: 600 E Main St. in Panora Iowa, in Guthrie County about an hour west of Des Moines. 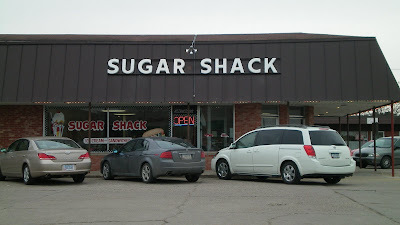 Directions: This place on the east side of Panora has a big green sign in front on Route 44, the main drag through town. Price: $3.75 a la carte, a good value for an average-size tenderloin sandwich, or in a special with side and drink for $6.50. Also available grilled. Service: There are a lot of people moving around the kitchen here, its counter service with food brought to your table. Ambiance: This place looks dull from outside but the interior is brightly lit and has a big mural of the bike trail covering a wall. There are tables inside and covered picnic tables for outside when the weather is good. 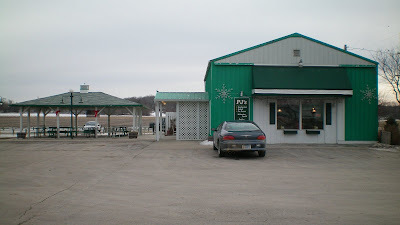 Final Thoughts: This place has a welcoming ambiance and is a great place to visit while passing through Panora. Its the best tenderloin I have found in Panora, after trying the Coyote Grill and 44 Drive-In already, the next place on my list is the restaurant at the Panorama National just north in Lake Panora. More than one person has recommended me to locate a bait shop in a small unincorporated township outside of Mt. Pleasant. For a long time Oakland Mills store was a cafe in an old railroad depot building, and a general store with live bait being made for catfish. Just a few years ago the owner retired and a cook from Mt. Pleasant took over the location. Some changes have been made, and while live bait is no longer sold, they still make the tenderloin from scratch right here. The mailbox in from still reads Oakland Mill Store in big letters. 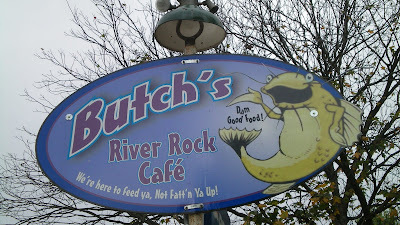 The new sign with a catfish claims "Dam good food", and "Were here to feed ya, not fatten ya up". Location: 1529 253rd St in unincorporated community of Oakland Mills in Henry County, just five minutes drive from Mt. Pleasant in Southeastern Iowa. Directions: You reach Oakland Mills by going south on Franklin from Old Highway 34, or take Jefferson St. south from Mt. Pleasant. The Cafe is across from the dam, good luck. 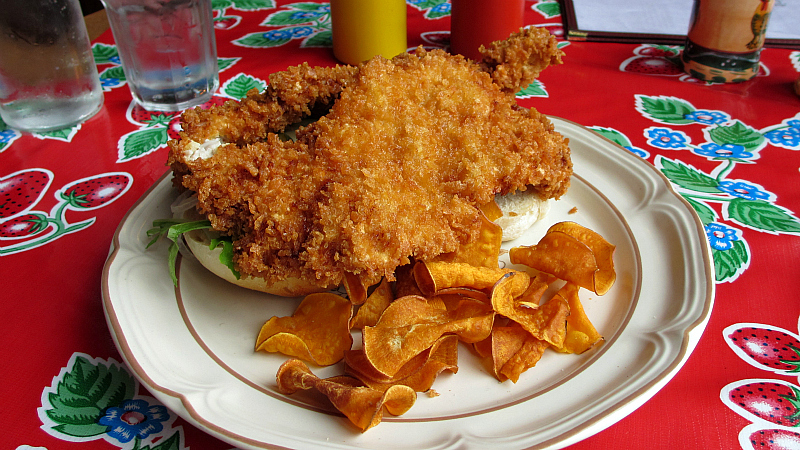 The Tenderloin: This is a very large slice of pork loin pounded into the usual tenderloin shape clearly filling the plate. The thickness varies, so it was probably pounded by hand. 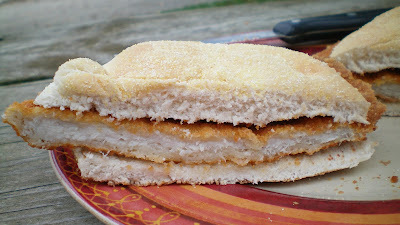 The breading tasted like cornmeal with only the slightest seasoning. There was plenty or pork hanging over the bun. Overall 7.75/10. Price: $4.25, a la carte,a good value, served with a steak knife. Also on the menu: Homemade pies are the specialty, so are burgers including an elk burger and hamburger salads. Service: Its seat yourself with a busy waitstaff, one had a shirt with the definition of the word "tenderloin" printed on the back. Ambiance: This is a small old building that has been renovated a couple times to expand the dining area. The booths and tables are small, so is the counter. Outdoor seats are available also. There is no longer fish bait or live worms right next to where everyone eats. Final Thoughts: From the cafe you will hear the century-old dam that once powered the mill serving a prosperous community. While the mill closed a long time ago, it looks like the fishing and outdoor activities bring their share of visitors to Oakland Mills. The road from Mt. Pleasant has some new houses and is paved the entire way to the main intersection of the small community. I may never know how this new cafe compares to the old Oakland Mills Store, or its tenderloin. But the place was filled with locals when I stopped in, many were getting the tenderloin. 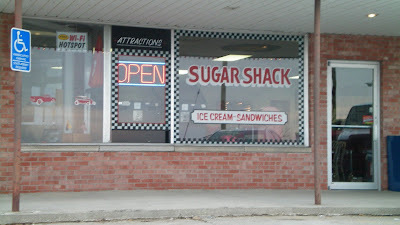 The Sugar Shack is an ice-cream place in an old shopping center in the older part of Altoona. I often imagine these place as being filled with sugar-charged little kids screaming at each other. Its usually not my cup of tea, but a homemade tenderloin on the menu made this a place for I had to visit. Location: 100 8th St SE in Altoona, just east of Des Moines. Directions: 8th Street is the main drag through the suburban community of Altoona, you can take Hubbell Avenue in Des Moines to reach it. 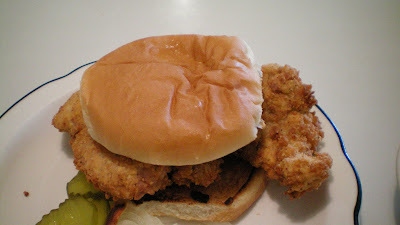 The Tenderloin: This one had good size and clearly stuck out from the bun. The white meat was pounded thin, but was close to the "pork jerky" level of toughness. The edges were especially dry, perhaps it was overcooked. This gets a slight deduction for the cold bun. Overall 6.0/10. Also on the menu: Full ice-cream menu with burgers and other junk food. Service: Its counter service with the whole show run by teenagers when I visited. Ambiance: This is a family friendly ice-cream place with bright colors and tacky 50's decorations that look like they were bought at the mall. Final Thoughts: This might be the most family-friendly tenderloin place in Central Iowa. Its the only homemade one I have found so far in Altoona, although I may have to try Claxon's Smokehouse or the Prairie Meadows Concession Stand to see if they serve homemade tenderloins. UPDATED WITH NEW VISIT AND NEW PHOTOS SUMMER 2014: I was able to make it back and I wasn't satisfied with my first batch of photos. 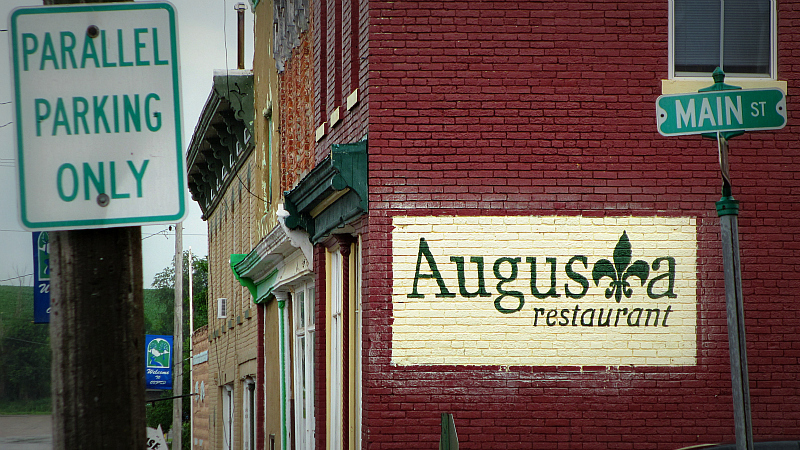 I had always stopped in when I was in too much of a hurry to eat in or when the Augusta Restaurant was closed. 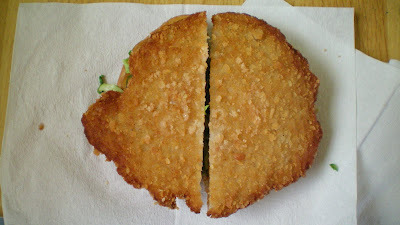 The new loin they served me was so tenderized that it broke into two pieces while cooking. The bun was just okay but the mayonnaise adds a little bit of a tasty rich extra bite on the top. 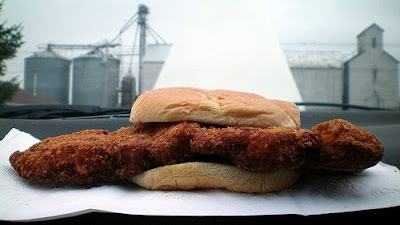 The Iowa Pork Producer's Association releases an award for the best tenderloin each year, and this place won in 2008. 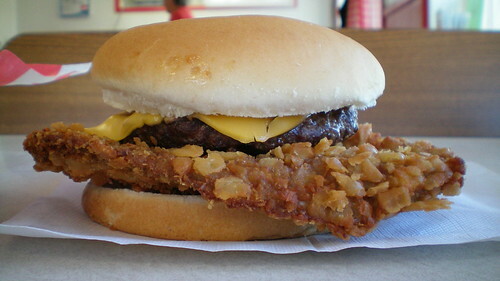 Many agree that this is probably the best of all the tenderloins to win the annual award for "best tenderloin". Its at a place founded by a couple of Louisiana natives who moved to Iowa after Hurricane Katrina. Oxford was once "famous" for the book The Oxford Project, which took photos of the people here in 1985 and then again in 2005. Now its home to a great tenderloin. 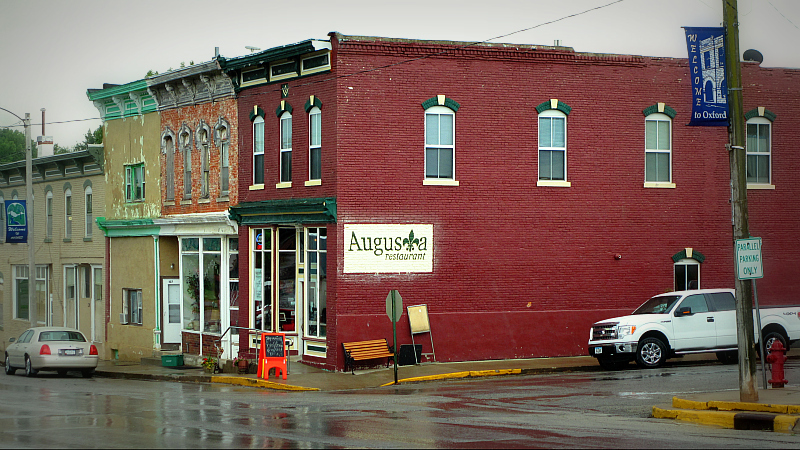 Location: 101 S. Augusta Ave. in Oxford, Iowa (population 705 in 2000 census). Its about 15 minutes west of Iowa City. Directions: You can take I-80 from Iowa City or Highway 6 from the Coralville Strip to reach the county road that forms Augusta Ave., the main street through Oxford. The Tenderloin: The size is probably just under the super-jumbo average of about 12 ounces, stretching across the takeout box. But this doesn't mean a sacrifice of quality for size. A theme here is high-quality ingredients. The bread crumbs are huge and get separated from the loin easily. Its a great cut of poirk loin, well tenderized yet firm and bright white inside. Served on a fresh toasted bun with tomato, mayo, and red onions. Overall 9.5/10. Price: $10.00, served with hand-cut fries or sweet-potato chips. Its still not the most expensive tenderloin in Iowa. Also on the menu: There is a full homemade Cajun menu including Crawfish Beignets fresh cut steaks. Service: Its only table seating inside with wait staff that must come from across the corridor area. Ambiance: You pass through a curtain to enter a dimly lit dining area with Louisiana color scheme of purple with accents of green and gold. Final Thoughts: This place is close enough to the population centers in Iowa City and Cedar Rapids to have this kind of place in such a small town. Having a couple of migrants from Louisiana come here and make the best tenderloin ever kind of pokes a hole through any logic in the idea that only Iowans can make these things right. Its hard to find a true replacement for the great tenderloin that Original Coney Island used to serve in the Skywalk before they closed last year. There is this place claiming a homemade tenderloin, and then there is Winston's Skywalk Pub and Battani's Pizza, each about a block away. Location: 555 Walnut St in the 3rd Floor Food Court at the Kaleidoscope at the Hub Building. Directions: You walk up the stairs from the bus station, its up a flight of escalators from the skywalk. Price: $4.35, with fixins or $7.50 in a combo meal. Also on the menu: The specialty is hamburgers, but there is a huge menu of homemade comfort food including a full breakfast. The menu advertised a "frenchie" sandwich when I visited. Service: Its just a counter, you wait for your number to be called. Ambiance: This is just a big food court with lots of fast food for the office crowd, its abandoned after about 2 in the afternoon. Final Thoughts: This isn't exactly a tenderloin worth making a trip for. 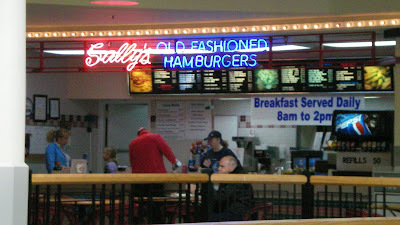 However, what Sally's gives you is far Superior to what Maid-Rite dishes out at the other end of the food court. Its also a good value for your money downtown. 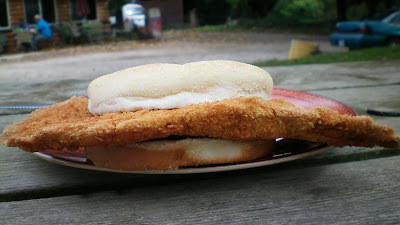 I think I had tried at least four places in Boone looking for homemade tenderloin, but couldn't find one. 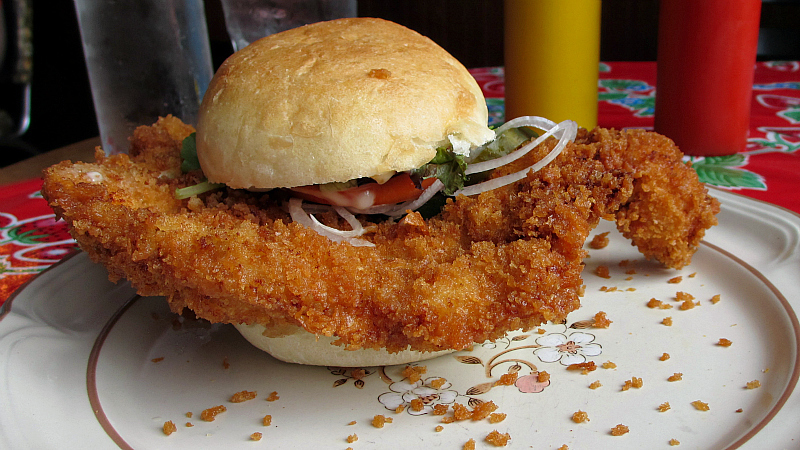 Just down the highway in Ogden is a legendary giant tenderloin. Its at a small sports bar that has changed location a few times, but perseveres and stays in business for the small town of Ogden Iowa. Location: 113 E. Walnut St in Ogden in Boone County. Directions: Walnut St. is the Old Lincoln Highway route through town, so take the Old Highway 30 or drive straight up 1st street from the Highway 30/169 junction south of town. Price: $6.65, with fixins and a side. Also on the menu: Large menu includes full breakfast and lunch that has burgers and the usual fried appetizers. Service: There is table service, but I went to the bar because the dining area wasn't busy when I stopped by. Ambiance: There's a well-lit dining area in front with a darker bar area in the back. The walls are decorated with sports junk and a picture of Elvis. 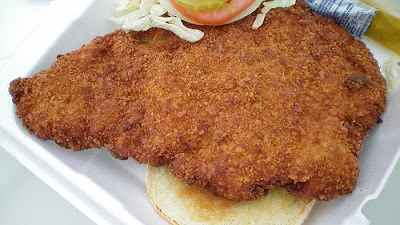 Final Thoughts: This was referred to on the menu as a fritter but its clearly a homemade tenderloin. The folks at BK's can be proud of this one.